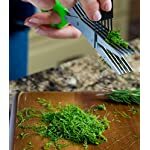 YOU WILL LOVE THE WESTMARK STAINLESS STEEL SCISSORS OR YOUR MONEY BACK: This wonderful herb scissors is guaranteed to be the best herb scissors you have ever used in your kitchen or your money back no questions asked! 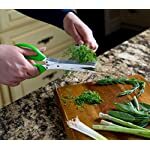 THIS WESTMARK HERB SCISSORS HAS 5 RUSTPROOF BLADES MADE OF STAINLESS STEEL: The Westmark herb scissors has 5 rustproof blades that allow you to cut all types of herbs quickly. 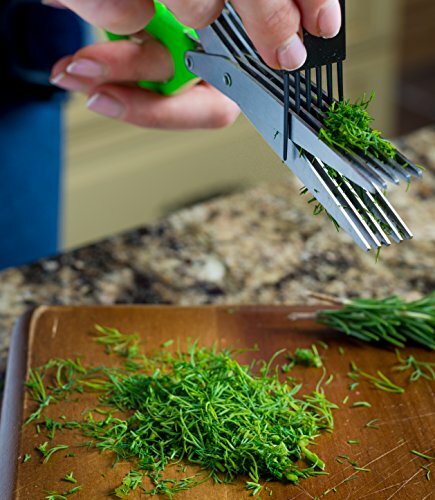 No matter what herb you are cutting, the Westmark German blade is up for the job! 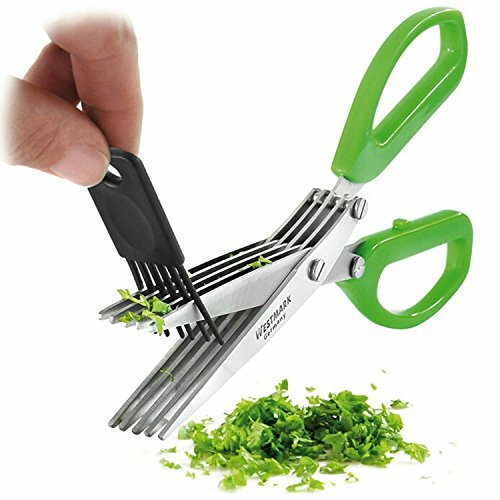 WESTMARK HERB SCISSORS COMES WITH CLEANING COMB: When you purchase the Westmark herb scissors, it comes with a cleaning comb that will help you to easily and safely clean your herb scissors. 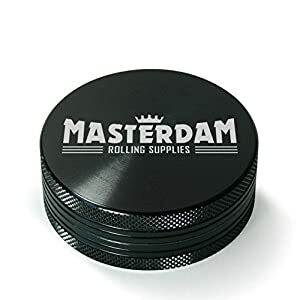 This additional add on is invaluable in quickly and safely cleaning herbs off the blades! 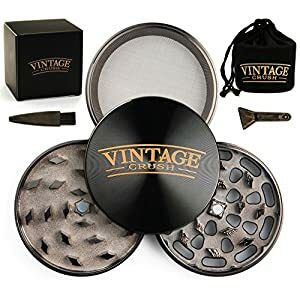 HIGHEST QUALITY WITH TREND AND TRADITION! Westmark of Germany is well known for its quality craftsmanship of kitchen gadgets. Westmark has been making reliable kitchen products for over 50 years. As a specialized and reliable partner, Westmark offers a wide range of practical and uncomplicated kitchen products designed to make cooking and life in the kitchen easier. For traditional reasons, Westmark produces most of their products in Elspe, Germany. 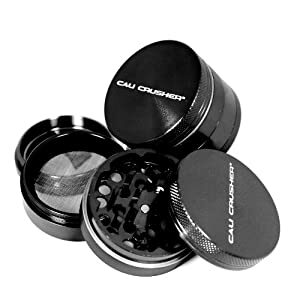 Money Back Guarantee: If you are not happy with our product, simply return the item to Amazon for a full refund, but we are confident that you will LOVE our product! 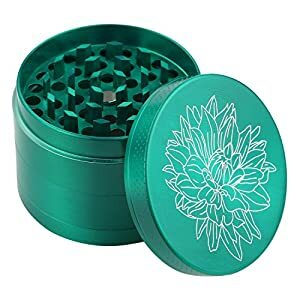 GREAT LARGE GREEN HANDLES MAKES GRIP SAFE AND SECURE: No longer do you have to worry about working with a flimsy herb cutter. 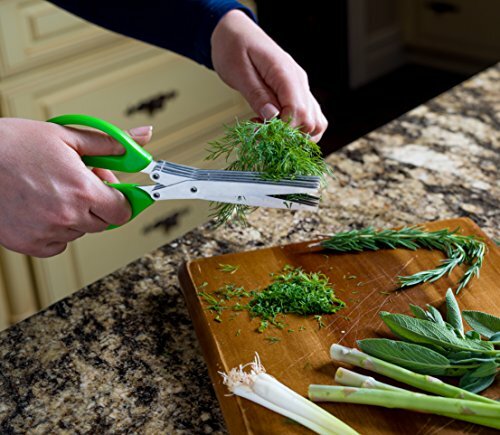 The high quality Westmark herb scissors has durable plastic handles that allow you to maintain a safe and secure grip. No matter what you are cutting, you keep your hands safe and relaxed! 5 YEAR WARRANTY: Westmark Germany is so convinced that you will like your Westmark herb scissors, that they will refund every penny if you don’t love it! 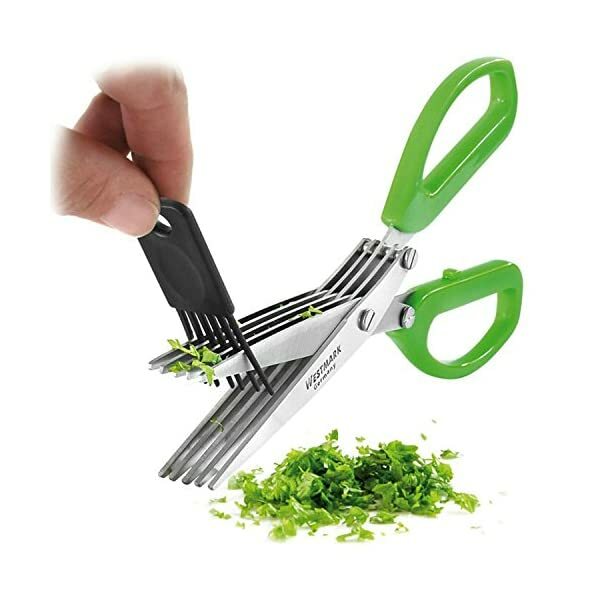 Either you get the herb scissors of your dreams or your money back!